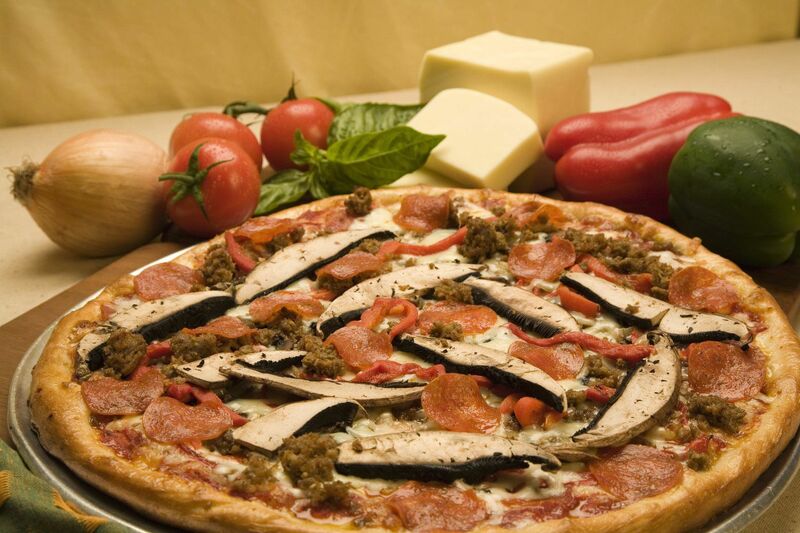 Gourmet Pizzas Menu - Barry's Pizza Has Been Serving Awesome Pizza For Over 30 Years! Pizzas are baked in traditional stone deck ovens. They come in two varieties: Hand-Tossed and Deep Dish. We use only the freshest ingredients and our own exclusive mozzarella cheese. Deep Dish prepared on white or wheat crust. Pepperoni, mushrooms, ham, bell pepper, onion & Italian sausage. Andouille sausage, roasted red papper, red onion and grilled jalapeños. Pepperoni & fresh Italian sausage with Portobello mushrooms, roasted red pepper & roasted onion, lightly sprinkled with Asiago cheese. For the serious meat lover! Sautéed mushrooms, Portobello mushrooms, red onion, artichokes, roasted red pepper, whole green olives, combined with mozzarella & ricotta cheeses, & sprinkled with fresh basil. Chicken tossed in spicy buffalo wing sauce, diced celery, red onion. Drizzled with bleu cheese dressing, & garnished with cilantro. Olive oil, marinated grilled chicken, garlic, Kalamata olives, sundried tomato, pepperoncini peppers, feta & fresh basil. Mushrooms, bell pepper, green & black olives, red onion & tomato. Hand Tossed & Deep Dish. *Extra charge for premium toppings. *Ordering specialty pizzas by halves will result in per topping pricing. Available in Small Thin Crust Only. The price of a Small Neapolitan plus $2.00. While we strive to ensure our gluten-free items are safe for your diet, we cannot guarantee with 100% confidence that contact with flour will not occur, as we are not a gluten-free kitchen. Please let your server know if you any food allergies whatsoever.